Submitted by JoeKeresztury on Mon, 06/14/2010 - 11:31. In the San Antonio area since the 60's, we pretty much have had all slab type foundations for new home construction, thus doing away with the pier and beam type foundations used during previous decades. 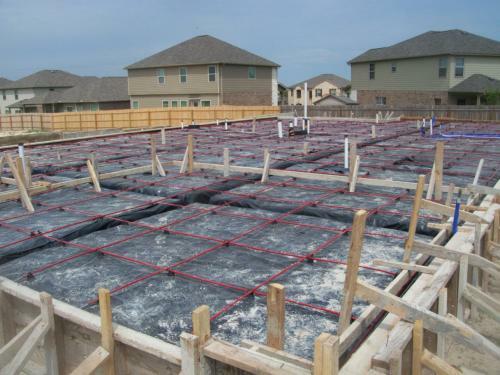 At first re-bar steel reinforcement type slabs were used for years until post tension slabs came on the scene and has increased in popularity more and more in the last twenty five years or so especially with the local volume builders using this type of foundation on their homes being built. Slab foundations do need reinforcement. Concrete is strong in compression but weak in tension. The tensile strength of concrete is only approx. 15% of it's compressive strength. That's why the reinforcement of a concrete foundation is needed by steel reinforcement ((rebar) and / or post tension cables. As building materials, concrete is very strong in compression, but is relatively weak in tension. Steel, on the other hand, is very strong in tension. Putting the concrete into compression and the steel into tension before any substantial service loads are applied puts both of these building materials into their strongest states. Post-tensioning is a method of reinforcing (strengthening) a concrete slab on grade with high-strength steel strands. These strands or cables are also referred to as tendons. High-tension steel tendons enable slab foundations to withstand the stresses of shifting & expansive soil conditions that are prevalent in the San Antonio and surrounding Texas areas. San Antonio and much of Texas is well known for their shifting and expansive clay soils. During the hot, dry summer of the San Antonio area, clay soils shrink, and during extended periods of wet weather soil naturally tends to expand. Since the slab foundation itself protects the soil directly beneath from wetting and drying, most swelling and shrinking takes place at the edges of the foundation or even slightly below it. That is why proper drainage slope and balanced moisture around the foundation is always important to help prevent settling issues that may affect the foundation and the entire structure of the home. 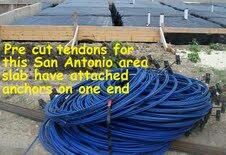 Pre cut tendons (cables) are shown as delivered to a new home construction job site in the San Antonio area. The dead end anchors are seen at right side of photo attached to the cabe ends. Plastic sheathed tendons (cables) arrive at the site cut to length, with the dead end anchor plate already wedged in place . 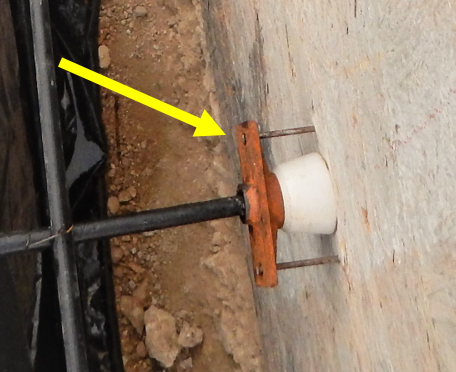 This pre attached dead end anchor is nailed to the form board half the slab thickness from its top edge, and a U shaped steel backup bar is wired to the anchor to help distribute the eventual tensioning pressure over a wider area of the slab edge. The thick sleeve at the end of the tendon is designed to protect the cable and fitting from corrosive soils that may be present. (Left)- Pictured is the stressing / tensioning end of a post tension cable with the pocket anchor. The pocket allows access to cable after concrete pour. This is also referred to as the live end and then shown (right) is the dead end anchor - non tensioning end of post tension cable. Post Tension cables are shown with strands / tendons. The cables are lubricated between the plastic sleeve (sheathing) and the strands allowing cable stretching freely during the tensioning stage. 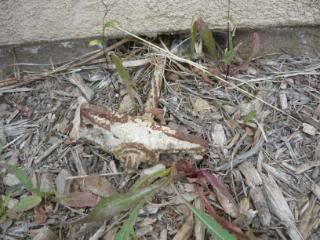 Tendons are sheathed with a tough plastic sleeve that prevents the tendons from bonding to the concrete. 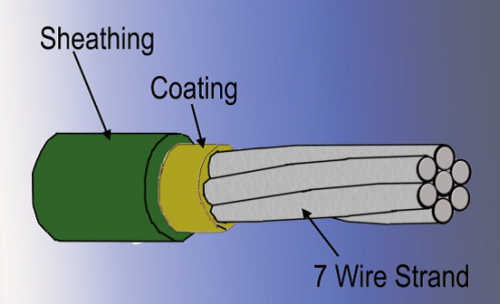 A coating of a grease lubricant between the plastic sleeve and the tendon strands inside allows the cable to stretch freely during the tensioning process. The tendons are unrolled across the foundation for installation to the tensioning end (pocket end) with the anchor (dead end) on the opposite slab edge. Tendons don't have to run in completely straight lines. The tendons can be diverted a foot or two to one side to avoid plumbing, forms or other items causing an obstruction, as long as the tendons (usually 1/2") follow a gradual curve. The exact spacing of the tendons will vary depending on the thickness of the slab and other variables as determined by the foundation engineers design. A spacing of 3 to 4 feet on center in a crossed grid pattern is typically used on most residential post tensioned slabs in the San Antonio area. The reinforcing strands/ tendons and their specialized end fittings are cast into the center of the slab thickness before the concrete pour. After the slab is poured the forms are wrecked (removed) and the slab is allowed to cure. Usually 4-7 days after the concrete of a post tension slab is poured and before it is totally cured, the contractor comes and tightens, stresses the strands/cables to within 7% of the engineers designed strength of between usually 27,000 and 35,000 psi. After the concrete has cured for a few days, each cable/ tendon, is stretched with a hydraulic post tensioning jack. 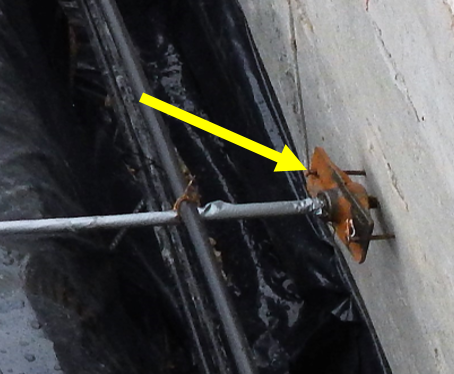 The jack bears against one of the (pocket end) anchors that is embedded in the concrete and pulls the steel to a predetermined force. As the tensioning is occurring, the steel is being elongated, and the concrete is being compressed. When the proper tensioning force is reached, the prestressing steel is anchored in place. 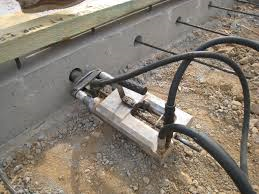 The anchors are designed to provide a permanent mechanical connection, forever keeping the steel in tension, and the concrete in compression. Post Tension Slab shown curing after the slab pour, forms removed, with cables waiting to be tensioned to engineers specifications (left). Post tensioning with hydraulic stressing jack shown (right). 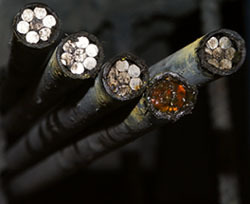 Image shows procedure for stressing of post tension slab cables. 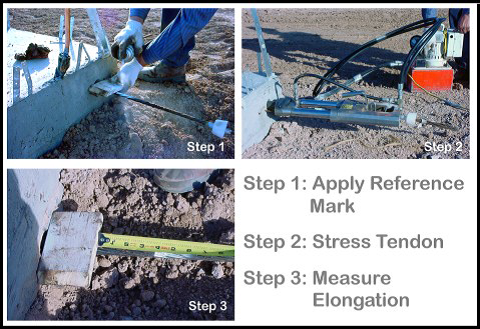 First the technician gauges a reference point on the cable, then using the tensioning hydraulic jack stresses the tendon to engineers requirements, then after stressing verifies elongation on tendon (cable) to be as needed. Post-tensioned slabs puts the slab in tension after the concrete has cured. This can help to minimize cracking and differential settlement in adverse conditions. The result is a stiffer concrete member that is being actively compressed and has more capacity to resist tensile forces. Tendons (strands) have to be stressed at a specific time during the curing process, usually 4-7 days after concrete placement and specifically not more than 10 days. The stressing operation should start as soon as the concrete attains the proper strength. Stressing them too late allows the slab to advance quite a bit through the curing stage. After a certain point, the slab is most likely getting too strong to allow the tensioning (stressing) process to close most cracks that opened up during the initial curing. From the above photo this appears to be a blowout in a post tension slab. The anchor shown should be embedded in the slab. Looks like there's concrete on the anchor here (in the pic) so the cable/ tendon was probably stretched as needed then had a blow out. Appears that cable and anchor have been exposed for a while due to the rusting. The size of the hole in the slab looks about the size of the anchor, another indication of a blowout. The effects of the blowout inside could have been just a loud bang with no damage or it could have tore up thru the concrete and flooring as it snapped. If so it may have been patched on the slab with an epoxy with the flooring redone. The repair could have been engineer approved or maybe not. But I also don't see why if they did resolve inside issues, if there was (damage) issues then why they didn't address the outside situation, the exposed, rusting outside slab reinforcement cable, wedge and anchor along with a good sized hole in the slab, it's a smoking gun indicating that there has been a structural issue with the foundation, even though a slab can still be sound with the blowout of just one tendon it should still be repaired on the outside as far as cutting and sealing the affected area. Also, as seen in the picture there is not the required 4" slab exposure below the stucco, which of course is even more of an issue since there is a hole in the slab. A minimum of 4" is required at the base of the wall between masonry and finished grade for proper drainage and to avoid water intrusion into the exterior wall assembly. 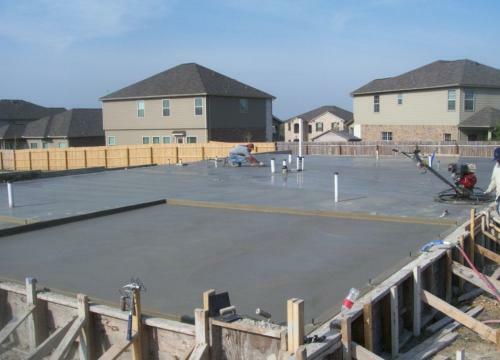 Post tensioned slabs have, as noted gained in popularity over the years especially with the local San Antonio volume builders, mostly due to cost factors and even due to time factors. Post tension slabs do have more of a risk then the more expensive rebar slab foundations that still seem to be preferred by local custom builders. One risk with Post Tension Sabs is that there is a risk when chipping, cutting or drilling into the slab foundation for repairs or remodeling. Snapping a tendon (cable) is the big concern with post tension slabs when changes or repairs dictate alterations in the concrete. If penetrating into the slab is needed it is highly recommend to have the location of tendons identified. The initial risk for post tension slab foundations is due to the possible problems of improper stressing of the post tension cables. When errors are made on-site during the post-tensioning process, the ability of the reinforcement to prevent cracking is decreased. As a result, even though post-tensioning is meant to help prevent a slab from cracking, the slab can still crack if the tensioning process is not done correctly. But this concern can be overcome by good engineering and the contractors proper execution of engineers specifications for foundation placement and tensioning. Otherwise, issues can possibly develop, leading to costly repairs and an unhappy homeowner down the road that is stuck with structural issues and/or expensive repair costs. Joe Keresztury of JWK Inspections is available for Home Inspections Monday thru Saturday for San Antonio, Schertz, Garden Ridge, New Braunfels, Boerne and all South Texas surrounding areas. Commercial Inspections, Consulting and Construction Management services available. Submitted by Bert de Haan (not verified) on Sat, 07/10/2010 - 07:37. Very interesting Joe. Construction practices in my area are certainly different from those in San Antonio. 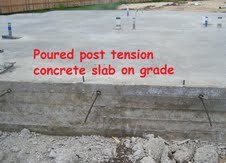 I very seldom see a house on a slab-on-grade foundation and I have never seen one on a post tensioned slab. Large commercial buildings and parking garages have post tensioned slabs and beams, but I don't do commercial inspections. Not everything in San Antonio is different from here in Kitchener Waterloo. In your photo gallery I saw that some of the defects are exactly what I would find here. Some honest mistakes but also several defects that show an I-don't-care attitude. Keep the public informed with good post like this one. Thank you. Submitted by JoeKeresztury on Sun, 07/11/2010 - 02:17.
www.jwkhomeinspections.com Thanx Bert, I'm sure there are many differences in construction and home inspections in Kitchener Waterloo, Canada as compared to San Antonio. I'm assuming you have basements in your area. That might be a good idea for a blog on your site. Here the post tensioned slabs are gaining in popularity as compared to the rebar slab on grade.